While protesters marched through Slovenia’s capital, Ljubljana, earlier this month, a new government was being formed only a few streets away. The change of government is one of the outcomes of protests that have included as many as 100,000 people across Slovenia since a local corruption scandal surfaced last November in the industrial city of Maribor, Slovenia’s second largest population center. People have been demanding, in particular, the resignation of political elites who have been in power ever since Slovenia’s split from Yugoslavia in 1991. A member of the European Union since 2004, this tiny country of two million inhabitants between the Alps and the Adriatic Sea has been severely hit by the Eurozone recession, and it is on the verge of a bailout. Severe austerity measures following bad bank loans have resulted in rising unemployment and poverty, as well as uncertainty about what the future will bring. Since the protests started in early December, four nationwide uprisings have been organized — the last one on March 6. Over 100 initiatives have been formed, including a women’s movement, virtual meeting spaces, writers’ organizations, artist-activist groups, an anarchist federation, a sustainable-development cooperative, a trade-union revival and a growing Pirate Party. From the start, the protests have been organized in a decentralized way, with self-organization as the guiding principle and social-media networks as communication channels. Even the country’s most prominent media, including two leading newspapers — the Delo and the Dnevnik — have opened their pages for citizens to offer fresh alternatives to the challenges Slovenia is facing. As a result of this unprecedented protest movement, the mayor of Maribor resigned in December — a first step toward the goal of freeing the Slovenian political scene from the most stubborn politicians. The national anti-corruption commission issued a report on January 8 that made serious corruption allegations against the heads of the two leading parties, including the right-wing prime minister Janez Jansa and the left-wing Ljubljana mayor Zoran Jankovic. The highly unpopular prime minister was ousted in a vote of no-confidence in the parliament on February 27 — marking another major step. On March 13, a left-center coalition agreement was signed, which was endorsed in the parliament on March 20. In line with protesters’ demands, the prime minister-designate Alenka Bratusek already announced that she would ask for a confidence vote a year after the government is sworn in to gauge people’s satisfaction. A state secretary will be appointed as a liaison to popular movements. 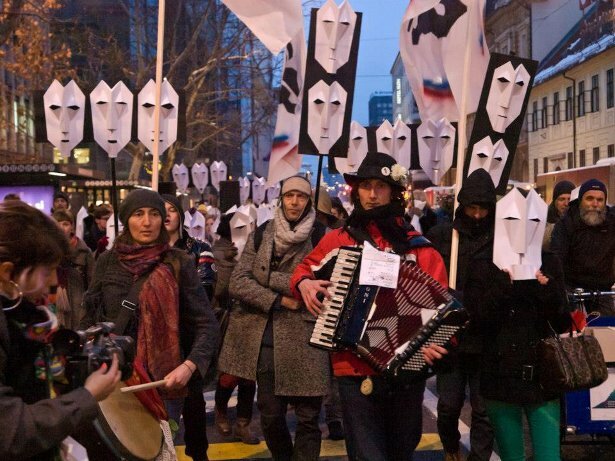 Protestivals build on the legacy of culture as a form of resistance in Slovenia’s history. Before joining Yugoslavia in the 20th century, present-day Slovenia was ruled by various Germanic empires for over 700 years. Expressing identity through a unique culture and language was thus necessary for surviving under foreign rule. The protestival goes by the motto, “Don’t wait for spring, spring is already here!” — a refrain from a popular Slovenian song. 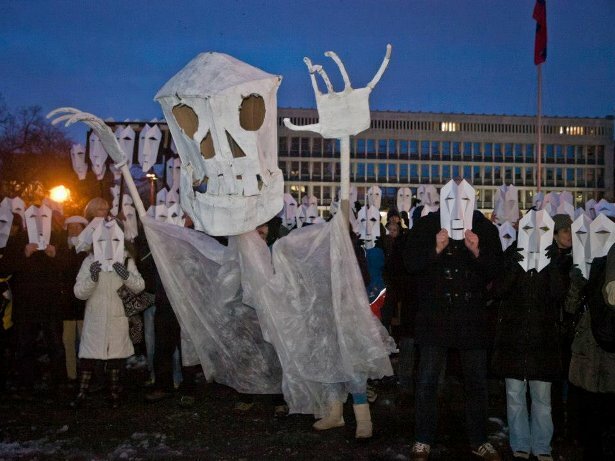 After Prime Minister Jansa’s party called the protesters “communist zombies” in a tweet on December 21, protesters came to the subsequent protestival masked as zombies, and masks have been a presence throughout the movement ever since. They stand for the rottenness of present-day politics, which protesters hope will be replaced by more life-supporting social structures. Nonviolent forms of collective expression have also been vital. After clashes between protesters and police early last December in which over 100 protesters were arrested in Maribor, groups have self-organized in ways that promote more peaceful gatherings. “Police are humans like us — we are in this difficult situation together,” said a group of women who started giving flowers to police officers after the December incidents. Flower-giving has become one of the symbols of nonviolent protest that repeats itself throughout the movement. What may await the Slovenian protest movement now, after the change of government, is a joining of forces to bring about change that goes wider and deeper. In order to succeed in doing so, diverse voices — from anarchists to peacemakers, from old to young, from unemployed workers to university professors, from those believing in direct democracy to those wanting to form a political party and operate within the system — will need to identify common denominators and ways of working together across divides. For a country that’s only as big as the suburb of a major city in some other countries, this may be an achievable task.